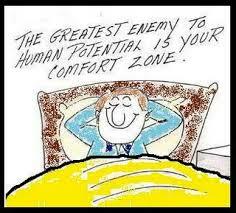 “Be willing to step out of your comfort zone once in a while; take the risks in life that seem worth taking. The ride might not be as predictable if you’d just planted your feet and stayed put, but it will be a heck of a lot more interesting.” – Edward Whitacre Jr. I seemed to ease my foot off the gas pedal this week and parked up in my comfort zone, with the engine running. I didn’t succumb to a wholesale binge but did find myself on a few occasions standing in front of the fridge with the door swinging, mindlessly grazing on slices of ham and slices of cheese. And sure we all know that the calories don’t count when you are eating while standing up, right?! I started off magnificently on Monday with a gloriously tough resistance workout in Hannah’s studio and was set for a vibrant and fun week ahead, pushing myself physically and keeping things interesting with lovely tasty meals. That was the plan anyway but as the week wore on I seemed to lose my stride and ended up carrying out the bare minimum to keep myself on the straight and narrow. I even went out running on Tuesday for the first time after 2 weeks of being unwell with chest infections and the vomiting bug and I felt so invigorated and energized being back out there. So much so that even though my training plan for that day was to reach intervals of 8 minutes of non-stop running with walking in between I decided to JUST RUN and see how I got on. I was on top of the world to reveal to myself that I could run 14 MINUTES before needing a walking break! I was so excited and proud of myself and couldn’t wait to get back out there. Bizarrely though the wheels came off the cart and I allowed my momentum to slacken for the remainder of the week with not much gumption or fire in my belly. I just wanted to hibernate and a sense of lethargy and apathy crept in. I was becoming annoyed at having to fill in my food diary and having to be so careful all the time. I allowed my discipline to take a tumble and became so uninspired with myself and what I was doing. My verve and zest to make a concerted effort to progress and keep pushing my boundaries slowed way down this week. My planning for Saturday was non-existent. I’d had my breakfast at 8am and was on the road bringing my boys to their soccer matches from 11am and wasn’t coming back into town on my own until 3pm, late for a family birthday party and ravenous as hadn’t eaten in 7 hours!! I had thought to make up a filling salad and lash it into a lunch box to have at the party and stay in control but was so disorganised it never happened. So when I got to that party I was like a big hungry contrary bear. I didn’t eat any sausages or chips but did have lovely grainy bread, potato salad, pasta salad but imagine there was oil on that pasta salad! I fancied my blood-sugar levels were still low so inhaled 4 or 5 Celebration Chocolates AND had a slice of creamy birthday cake! I have to admit I find family gatherings and celebrations where there is a lovely display and choice of food a very wobbly challenge as I enjoy catching up with everyone and enjoying the warmth and love of family. Right so, while parked up I figured to make the time to contemplate and interpret my progress so far. I acknowledged that my mental attitude needed recalibrating and also that I hadn’t gone way back into the middle of my comfort zone as such but merely just stepped back in behind the edge. I hadn’t lost the run of myself and didn’t end up gorging on junk food and decided I had come a long way from where I used to be, using food as a massive comfort and crutch. I may have parked up but knew I wouldn’t be turning off the engine and choosing to camp out here, like before. I may have stepped back in to the relative security of my comfort zone but know to stay there too long and get too comfortable would mean rationalizing unhealthy behaviour and choices. Before I’d know it I’d be on a collision course to horsing back on the 3.5 stone I’ve already lost by Christmas no hassle. There are many unhealthy activities and coping mechanisms that I’ve used in the past that I’ve managed to knock on the head, letting it truly sink in that they do not serve me or the healthy lifestyle that I am striving to gift to myself. For one, I can leave the supermarket now without having to buy cream cakes or a tray of mini chocolate choux pastries. The old me, when I was feeling distressed and/or melancholy would buy a box of 4 varied cream cakes to have at home on the couch but also buy a smaller box of 2 cream cakes that I could savage in the car on the way home as I couldn’t wait the 10 minute drive back to the house to gorge on the other four. I no longer do this thank Christ and try to actually feel my feelings and face the fear as opposed to stuffing them back down with food. In fact only recently while in the supermarket carpark a car drove up beside me and the overweight woman driver was in the middle of eating a sandwich. When she finished the sandwich she proceeded then to eat a cream cake. The eating seemed so manic as if she couldn’t get the food in quick enough and I really felt for her. That used to be me. I used to eat secretly in the car all the time, trying to comfort and soothe myself, attempting to take myself back down off a ledge of inner hysteria, seeking to numb a constant aching feeling of loneliness. manifesting an ironclad belief that I CAN DO IT! drawing up an exercise plan and menu plan for the next seven days and FOLLOW THROUGH with the plans. being conscious to take the ACTIONS required to make the changes I need to make, to ensure progress and results. reflecting on all the reasons WHY I am pursing a healthy lifestyle and visualising the best version of myself that I can be. My two chaps insisted on taking my photo during the week so that I could see what they could see, “Mammy! You’ve lost one of your CHINS! !” The photo on the left was only taken back in May, a couple of weeks before I started back in earnest with my healthy lifestyle campaign. I was at my heaviest, lugging around 17 stone 10lbs on my tiny 5′ 1″ frame. When I saw this photo and took in my Desperate Dan chin and how my eyes and face were suffocating under all that fat, I sobbed my heart out. I was unrecognisable to myself. 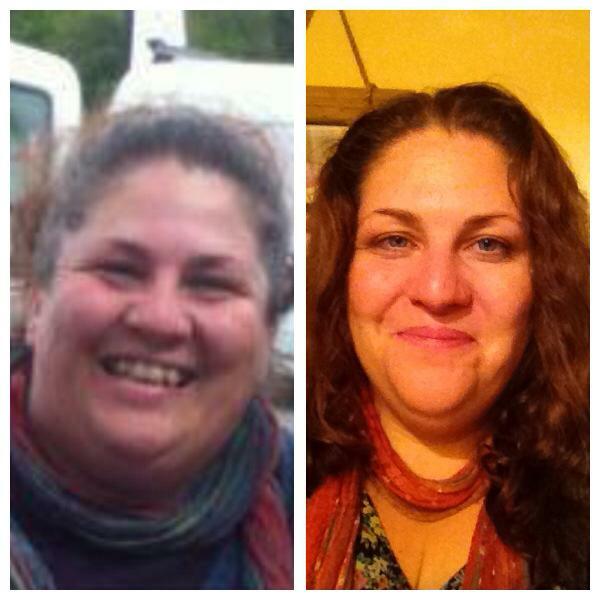 The second photo shows a much happier woman, with just under 3.5 stone lost and over 6 more stone to lose. My eyes can be seen now and my face is less puffy. I’m delighted with the obvious transformation that I can see for myself now although it looks like I’ve no eyelashes so may invest in a new mascara! 🙂 This week I have gained 0.25lb, not a tragedy, but need to pull myself together this week and get properly back on track with a more feisty mental attitude towards my goals. 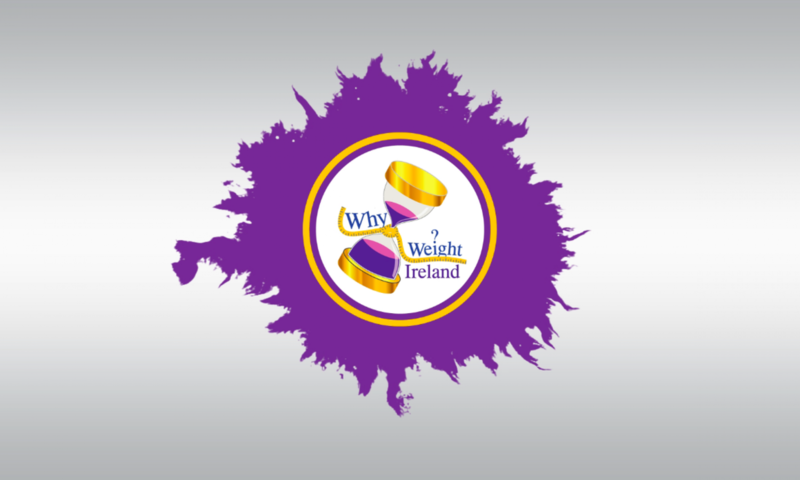 My total weight loss over 20 weeks is 3 stone 4.4lbs. Only 86.2lbs to go!! Please find below some recipes for some of my favourite meals that I enjoy making at home. Enjoy! 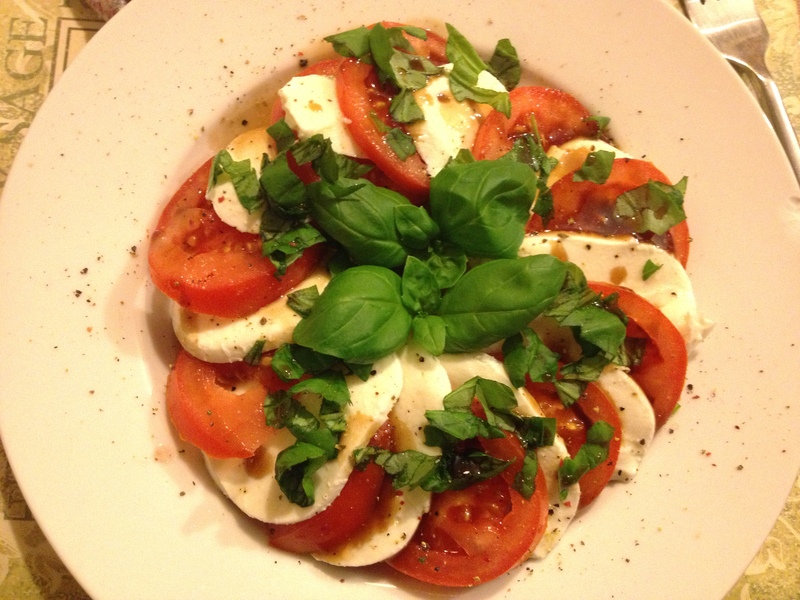 This is one of my favourite salads ever and so easy to make 🙂 I use Aldi The Cheese Emporium Lighter Mozzarella which cuts down the overall calories and my favoured dressing is Kuhne Balsamic Salad Dressing. This salad is 231 calories. Enjoy! Drain the pack of mozzarella and pat the cheese dry with kitchen paper. Cut the mozzarella and the tomatoes into thick slices and layer them over each other, alternating between cheese and tomato. Season with pinch of sea salt and freshly ground black pepper. Drizzle the balsamic dressing over the salad and sprinkle over the chopped basil, garnishing finally with whole basil leaves. Avocados are one of my most favoured things to eat. They are a natural powerhouse of nutrition, containing nearly 20 vitamins and minerals but also as important, a lovely ripe avocado tastes delicious! They are relatively high in calories but I find are worth it for the massive nutrition they provide and when honestly using the food diary they are very easy to incorporate into your daily allowance. This meal was 468 calories, very filling and delicious. If you wanted to lower calories even further you could use just half an avocado instead of the full one. Spread the houmous on the rye bread. 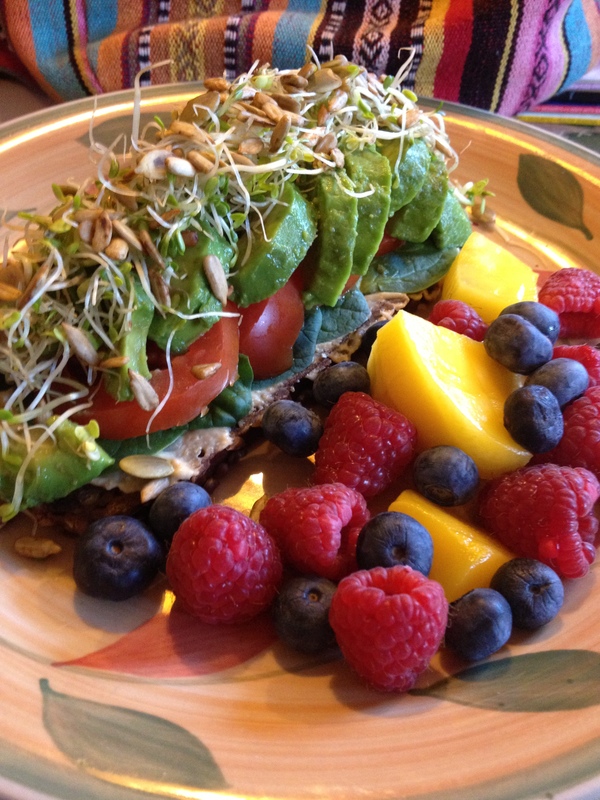 Layer on top the spinach leaves, tomato slices, avocado slices and topping with the super sprouts and super seeds. Serve with the chopped mango, raspberries and blueberries.